This could have been the name of last night’s lecture…had it been a lecture! Instead it was the Umbra Institute’s Pizza Workshop, a hot-baked mix of the history and biochemistry of pizza, followed by the main course, the pizza itself. Fifteen Umbra students followed staff member Zach Nowak down into the medieval Via della Viola neighborhood to the pizzeria “Pizza e Musica,” located in a nook (a former convent). Pizza e Musica, like many “neighborhood pizzerias,” has no sign, but it does have heart. 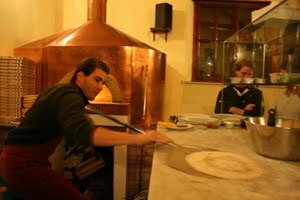 Head pizzaiolo (pizza-maker) Felice, a Neapolitan through-and-through, welcomed the students into the pizzeria. Nowak took a turn explaining some of the history of the pizza (including a digression on how the Pizza Margherita supposedly got its name) and how the dough rises. This was followed by the geography of heat in the oven: every pizzaiolo needs to know where the warm and cold spots are in his or her oven, and how to use these differences in heat to make all the pizzas come out at the same time. Arguably (well, actually no one present would have argued his) the best part of the night was the practical side of the workshop. Three students had the chance to get behind the marble pizza counter and stretch out their dough, adding toppings galore. Despite their inexperience, all three made up delicious pizzas for their classmates. And after that, everyone sat down and had yet another pizza for a perfect, tomato-topped conclusion to the evening.